Ever wondered how to check your 2.4G transmitter’s R.F output after replacing the aerial or how to eliminate the trans- mitter as the cause of a problem with range? 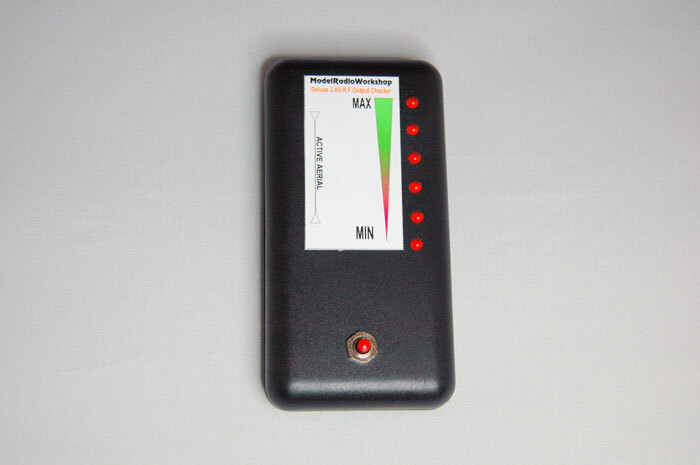 Well now you can with the Model- RadioWorkshop 2.4G R.F Output Checker – after seeing transmitters here in the workshop with little or no R.F out- put it was decided to make a device to do just that. Ever wondered how to check your 2.4G transmitters R.F output after replacing the aerial or how to eliminate the transmitter as the cause of any problem with range? Well now you can with the ModelRadioWorkshop 2.4G R.F Output Checker – after seeing transmitters here in the workshop with little or no R.F output it was decided to make a device to do just that. 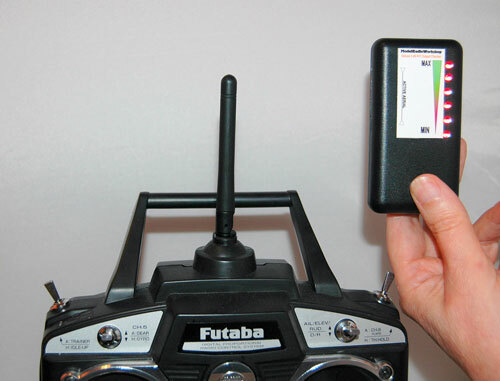 Place the Output Checker about 12cm to 15cm away from your transmitter parallel with the aerial (see picture below) and then press and hold the red button. The top two L.E.D’s will flash to tell the unit is working. Move the checker closer, at around 10cm you should get all six L.E.D’s to light up and even closer all the L.E.D’s will flash indicating stronger radiation. If you find that you have to get very close to the transmitter aerial to get all or just some the L.E.D’s to light then it is suggested that you have your transmitter checked by the relevant service department. When the internal battery becomes flat the L.E.D’s will strobe from top to bottom. Replacing the battery is straight forward. Push on the clips in the rebate on the side of the case with a small screwdriver and the case will open, then using the screwdriver push on the side of the coin cell (2032) upwards towards the main I.C. replace with a new battery and close the case.